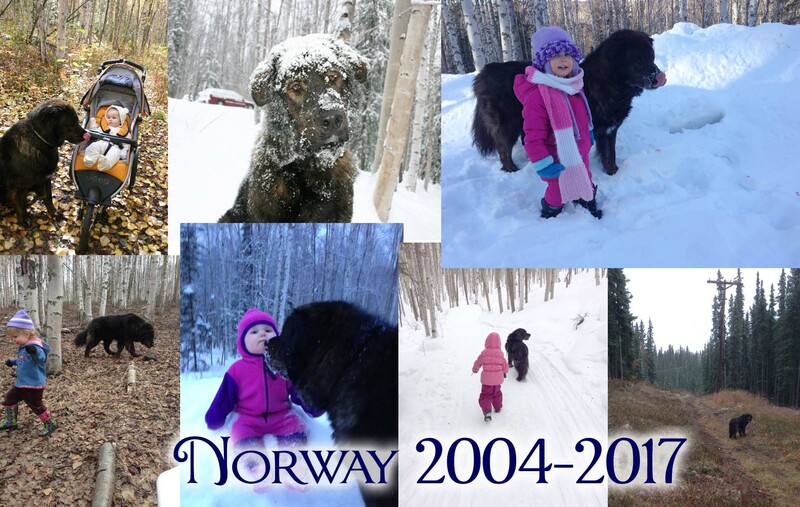 In human years, being a Newfie, Norway would be 96 now. He's had a long, beautiful life, and chased many squirrels and barked at many moose. That doesn't make it a lot easier to say goodbye. It's hard, seeing where he loved to lie. I keep listening for his bark. I will undoubtedly walk out 'to get him' out of habit for a while. I'm going to miss him. I'm even going to miss vacuuming up his ridiculous fur. Ellen's Blog: Wednesdaily with hot chocolate and tears. Poor Guppy did not appreciate being left at preschool this morning and chased me to the door in tears. The teacher is awesome about lifting her up and letting her wave through the window and getting her calmed down. I'm expecting a leveling up event of some sort, but it could also be that she went to sleep a little late last night. I'm drowning my feelings of guilt in a whipped cream hot cocoa from the fabulous sipping streams and getting ready to write a little. Went for a walk last night on the crunch snow with Guppy and Norway. My poor old man dog, he is not doing so well. He broke through the snow crust at one point and had to scrabble really hard to get out as I was coming to get him. He ended up dragging his back half for several hundred feet before his back legs started working again, and then limped and staggered the rest of the way home. He still wants to get up and go - so many interesting smells and things to go see! - but his body is just starting not to work so well. He's 13 now, and for a 90 lb dog, that works out to about 90 years old. He bunny-hops pretty frequently now (something old dogs do because their back legs won't comfortably support their weight individually anymore) and if things are slippery, his back legs have a tendency to go out from under him altogether. We've got extra rugs down in the house for him, since we've got slick laminate flooring, and he gets pain pills when he seems to need them. He's still eager to go out, but we have to be extra careful with him. He wants to run, but he shouldn't. Writing now, and some art things. Wednesdaily brief with clean dog. My dog smells like roses and feels like a baby duck. Seriously, I'm not sure he's ever been so clean and beautifully brushed before in his life. I took him to a local groomer, and she did a STUNNING job on our big tangled oaf. She filed down his toenails and brushed his teeth, even. If anyone needs a smelly dog fixed, let me know. I highly recommend this gal. New coloring book proof is ready to pick up, but that won't happen until tomorrow. I got orders out and updated my laptop and did no writing or artwork. Itching to remedy that last. Did get some client programming done. Thursdaily with a very gross morning. I was still cleaning that up when Guppy woke up and began crying. "I'm poopy! My sleeper's wet!" And yes, that required a load of laundry that included all of her bedding. Then, my house smelled like various foul things, besides which I had gotten lazy the night before and not picked up all the toys. So, there was a flurry of cleaning, and taking the trash out and such, which may not seem like the greatest way to start a day, but the result is a house much improved for the effort; it smells good and is not a disaster, and I feel rather accomplished. A few Patreon patron portraits to polish up today and scan, and I've got a programming thing for the Lilypad that has been put off too long. (Allowing artists to update their photos!) I'd also like to poke at some advertising for coloring books - I have a few local things to pursue, and I need to do some new postcards. Taxes are calling, too. I finished business taxes some time ago, but the rest of them need to be put together. Guppy is happily watching "Ariel" now, and then we'll go for a walk in the snow. Oh, and my NEW new phone is in, so I've got the fun and excitement of setting all that up. Thursdaily with more PA genius, more cold, and frozen hare heads. My genius continues! I am on portrait #1760, and chugging through the portraits. Will I finish in January? Hopefully! (But somewhat unlikely... there are still a LOT left to do.) When I can't stand checkboxes any longer, I poke at programming and taxes. I have finished an incomplete bit of the claim code that lets me hold a portrait for a specific client WITHOUT having to through the submitted description section of the site. I'm not sure why it wasn't finished up before - everything was in place to make it work seamlessly. The site will also now SHOW the claimed portraits correctly, which it wasn't before. It continues to be brutally cold in town (-40ish), but a balmy -22 in the hills where I live. I made Guppy go outside yesterday - we had skipped the day before, but I can't let TWO days go by without going outside. So, we wrestled into snowpants and coats and hats and mittens and boots, and she had a grand time romping while I gathered wood. Norway got to come inside for a little while - mystified by this requirement and not at all bothered by the cold outside (I was worried for my old man dog, but didn't need to be). He bounded back out happily went back to his run to lounge in the snow and dig for frozen hare heads. I don't THINK he finds them often, but the other night he was playing with something and I asked him to bring it to me. Ptooey! Dead hare head. No sign of the rest of the body. Just a frozen, eyeless, hairy, slobbery hare head. Dogs are gross. And lo! There was poop in the catbox this morning! I've never been so happy to see turds. Here is a shot of Guppy in the costume she loved trying on, but would not actually wear ANYWHERE we went yesterday. Ah well. It will continue to fit her for some time! She ate and drank and pooped copiously over Wednesday night, and appears much improved. However, there were no poops to report from yesterday or last night, so I'm desperately hoping she's not blocked up again. I'm giving her subcutaneous fluids (which is surprisingly fun - the only trouble is keeping her from rolling over on her side; she doesn't seem to notice the prick and purrs the whole time). She says she wants to dress up as a fairy today. We'll see if it lasts; the last time, the costume only lasted about 10 minutes before she wanted out. We got up several hours earlier than normal (before the alarm went off! zzzz!) and had a lot planned, so this might be an interesting day. Still 3 behind on INKtober and today is the last day. But it's also Sketch Fest... so it could happen if I get a good nap out of the small monster. I'm so close that I REALLY REALLY want to try to make it. Expensive Wednesdaily with Guppy photo, toddler tales. Aren't those the darlingest gloves? We did storytime this morning, and it was half-successful. She bolted around for the first half, loudly announced that she was done with storytime, and then, miraculously, spent the second half snuggled in my lap watching raptly. She charmed people at the post office on the way home - everyone loves her Anna hat and she was also wearing her purple Batman/Anna cape and velvety red boots with white pompoms and she cavorted shamelessly. Filling Kickstarter orders now. Not many - I haven't got the brains for it - but a few every day will get it done in good time. Monsterus Minimus is on some kind of sleep strike. I do get her down, eventually, but it takes a loooong time, and most nights, she's still babbling away when we go to bed. Right now, she's wailing, "I'm sad! I'm SAD!" from upstairs. "I need a hug! MOMMMMMY!" Then, it takes her so long to get down for her nap that I have to wake her up so she doesn't sleep through dinner, and she wanders around like a zombie. I was really spoiled by how easily she's gone down up until now. I have started laundry, done a bunch of running around, and made carrot cake. (Carrots were one of the few things that grew well this rainy, cold summer, so I've got a bunch leftover from our farm share.) Unfortunately, the one thing I REALLY needed at the Post Office wasn't there yet, so I'll have to do some more errands tomorrow. Coloring books! For grown-ups! How awesome is that?? Prepping the first book for the printed proof now! Woo! The next sea monster from the scale chart has been released! The Thunder-Whale is the biggest Torn World omnivore. Just a whale. That happens to be able to disintegrate your boat with sound waves. You can sponsor him for $25, which gets you a print of the final chart, and this original 9 x 12 artwork. (The original has a slightly shorter nose, which was adjusted digitally.) We are $35 from our next goal, which is a human diver for scale! Does she look grown up, or what? One of her cutest things lately is saying 'You're welcome!' with great enthusiasm. Her 'Thank you' is more like 'tan tu,' and usually not said that clearly, and her 'Please' is next to non-existent. But even if YOU don't say thank you for something, if she thinks you should have, she looks you in the face, smiles hugely and says, "You're WELCOME!' Sometimes she says it twice, grinning away. We went to the pet supply store today to get old-kitty treats and old-dog food, as well as a new collar. (Fred's has the food we like cheaper, but they only have the young large breed formula, not the old large breed formula. Both of the pets are getting old and creaky enough to spring for the senior varieties.) And Cold Spot is SO nice. The people are super friendly, and we found a hot orange collar that will fit the monster dog. I let the child free-range until she found the bulk cat food and would not leave it alone. So, I had to stuff her into the cart, protesting at the top of her shrill child lungs. She settled down quickly, and no one gave us dirty looks. At least, that I saw. They cooed over her at the front counter when we checked out, so presumably, they've seen worse. She is currently yelling 'HIIIIIIIII' at the top of her voice to let me know she's ready to get up from her nap. While I was in my shower this morning, the cat threw up a nasty wet hairball all over my clothing. I got a good night's sleep on Friday night, which helped overall. Sunday, little monster wanted to get up earlier than I was ready to (but not HORRIBLY) early, and last night we were up at 4. Still, even just that one really good night helped a lot and I feel better facing this week than I have in a while. *Post at TW The next segment of South Meets North is up! Read it here at LJ or at at Torn World! *eat - big breakfast finished! Giant lunch! Tomorrow Norway goes in for x-rays and very minor surgery (a skin tag right on his eyelid). We've been getting out for a good walk almost every single day, which I think has helped his hip/knee/back pain considerably... it didn't at first, but I think we've made very good progress on strengthening some of the muscles that support the area, and his weight is lower, which helps, too. He's loving the extra attention, and it's turned out very good and healthy for me, too - especially with the sunlight returning. I get a good dose of outside, exercise and 'not responsible, for a while.' We shall not speak of the embarrassing encounter with a very well-behaved Irish Setter, wherin my oaf of a dog dragged me into a hip-deep snowbank trying to say 'hi'. Off to do stuff now. Happy Easter and April Fools! Velcro not only lets Guppy tug on her fur, chase and pull her tail, grab her ears and pat her VERY vigorously, she actively comes up to where the baby is playing and flops down nearby. She starts purring loud enough to be heard across the room when Guppy finds her in her toy basket. She'll sometimes have enough and wander out of reach, but more often she sticks around until Guppy is bored. Strange, STRANGE cat. Need to get my day moving... c'mon brains, we've got work to do. ETA: Oh! And last night's dinner was quite something - we made 14 bean soup, with stock made from pork bones and hommade pork sausage, served with homemade bread and followed by the most AMAZING bread pudding I've ever made, from bread that was not only homemade, but also made with home-milled whole wheat flour, and drizzled with a (yes, homemade) maple whiskey sauce. YUM. And very pioneer-feeling. We've got DAYS worth of leftovers that I'm looking forward to. A little cleaning, a little writing (very little), a little coding, a little administration stuff, and a lot of baby-wrangling later, it's 3:30 in the afternoon, and I haven't blogged yet! Usually she's quiet when we're out walking - just looking around and soaking it in, but not today. We were overflown by a chatty raven, and I called back to it (I like to mimic ravens, and I'm very good at it. I will only do it outdoors, because it can't be done quietly...). We had quite a conversation, and as it flew off, Elsa started gurgling in imitation. She had comments the rest of the walk - ahhmaaamaaamaaaah, blaahBLAAHblaahblaah and ooooOOooooOOOOO are some of her favorites right now, but that particular gurgle was very definitely an attempt to talk with the raven and I. Also, I weigh .4 lbs more than my dog right now. This probably isn't particularly good news for either of us. I'm going to go eat some more food.